Megan grew up in West Central Wisconsin, the second-oldest in a family of four girls. She studied Theology and Spanish at the University of St. Thomas and is currently working toward a Master of Linguistics degree at the University of Chile. 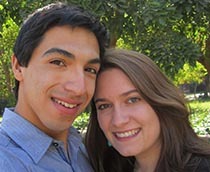 She met her fiancé Juan while studying abroad. Juan, also the second-oldest in a family of four kids, grew up on a farm in Tinguiririca, Chile and is currently finishing his degree in Agronomic Science at the Pontifical University of Chile. The couple were married in July 2015.